A few of my lip brushes. Very exciting eh! A post on lip brushes (purely for completeness) in the continuing "brush" series... this one is going to be relatively short and sweet! ... to a small area. Applying straight from the bullet, or using a disposable doe-foot applicator, dabbing it on (or sheering it out) with fingers, all of these work just fine. Obviously, large fluffy brushes ain't gonna cut the mustard here, you need a flat brush, preferably just ever so slightly dense and with ever so slight of a point or at least a rounded end. That's it, there's not much more to it than that. This is the one area of makeup where I'm not too particularly fussy, and haven't spent a small fortune amassing tools. So what do I use/recommend? As you can see from the picture above, I've got a few (very old now) Bobbi Brown brushes of very slightly differing shapes and sizes (all are synthetic). I also recommend a small brush like the Real Techniques Detailer brush (from the Core Collection - see this post for a review of the Real Techniques brushes). The Lancôme one I think is the old #8 concealer brush (the number has long worn off) but I use it for lips - it's reasonably dense, reasonably rounded/pointed, and features natural hairs (the Lancôme brushes have been "rebooted" now and have all changed slightly). A good budget offering is the Crown IB117 Oval Lip - this is a synthetic (taklon) brush and really excellent, especially for more sheer looks or smaller lips. And at in-or-around €3, you really can't go far wrong. My favourite lip brush - Face2 brand (avaialble in Ireland). The ones I love (although I'm not 100% sure you can get them anymore) are these: Face2 lip brushes. In the past I've always hated retractable lip brushes or ones that have a lid (which these have), mainly because the lids invariably get loose and just fall off and you lose them somewhere, which bugs me no end (these lids have stayed put so I don't need to lose my knickers with annoyance). They look good and with the lid removed and attached to the back of the brush, they make for a nice length brush, which I personally prefer to use (I don't generally like shorter, travel-sized or stubby brushes). These are natural fibre and reasonably dense, reasonably rounded and work for all lip sizes. I also love the fact that I bought about a dozen of them at €2 each in a bin-end sale at the Make Up For Ever store (Clarendon Street) about eighteen months or so ago. All unused, all perfect, just overstocked. Nice. 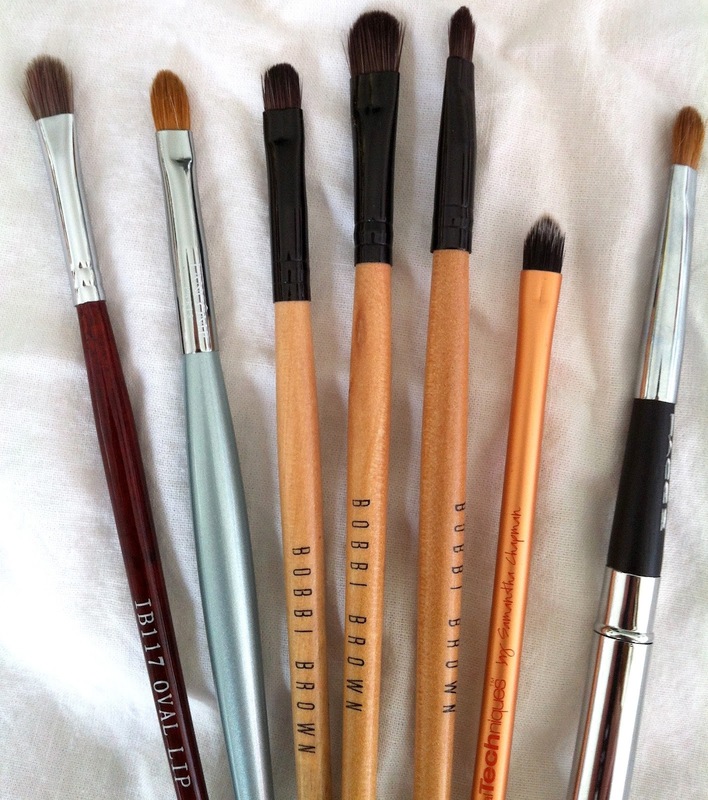 At the time, I thought that they'd work nicely as class brushes, but I've discovered that I love them for my kit and my own use too. I have also used concealer brushes (see this post) and eyeliner brushes (see this post) as lip brushes. And even detail eye shadow brushes (see this post). Anything small will do the trick. Ultimately though, lip brushes give a nice finish and are a nice-to-have but are not 100% necessary, unless you're a makeup artist, or plan on sharing your lipsticks, or have de-potted them (look here and here and here and here and here for some great containers for this - that's more than enough links I think!). Just one will do you, and it doesn't need to be expensive.